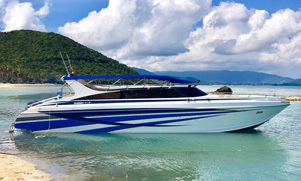 Phuket Hire Speedboat Private Daytrip Tours. Rent | Charter Own Boat. Those fantastic power catmarans bring you to further destinations for a private day trip in Phuket. Unlike normal speedboats they are much more stable in the water and can even go faster. The boats are available for day and overnight trips in Phuket and its sourounding waters. Travel at speed and in comfort and style and get away from the mass tourists. 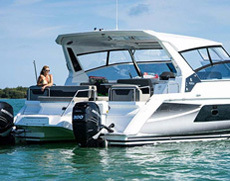 This 36 foot Power Catamaran offers a lot of comfort and fun for private speedboat dayt rips in Phuket for up to 10 guests. Prefered trips are the Mai Ton Three Island Trip or the Phang Nga National Park (James Bond Island) Tour. Good fun and unique for Phuket are the water toys like the floating jacuzzi. 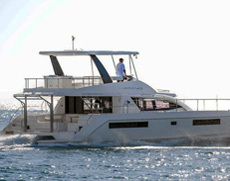 This Power Catamaran offers plenty of space and comfort for up to 15 guests for daytrips in Phuket. Luxury overnight trips for 6 guests in three double cabins. This Power Catamaran is fully aircondionated. She has water toys as well, even a slide plus she has two kayaks aboard to explore the Hongs (Caves) in Phang Nga Bay. 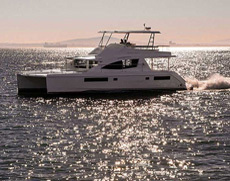 A fantastic and brand new Leopard Power Catamaran. Plenty of space for up to 20 guests for private daytrips in Phuket. Enjoy pure luxury and comfort. Fantastic for overnight trips in Phuket and sourrounding islands for 6 guests. She has all the water toys like floating jacuzzi and the slide as well.